“To me the task is a loathsome one. I go, I go in the spirit of a soldier who acts against his best judgement at the orders of his superior.” – Michael Collins on being sent to the Treaty negotiations by De Valera. “To go for a drink is one thing. To be driven to it is another.” – Michael Collins in a letter during the treaty negotiations. “When you have sweated, toiled, had mad dreams, hopeless nightmares, you find yourself in London’s streets, cold and dank in the night air. Think – what have I got for Ireland? Something which she has wanted these past 700 years. Will anyone be satisfied with the bargain? Will anyone? I tell you this -early this morning I signed my own death warrant. I though at the time how odd, how ridiculous -a bullet might just as well have done the job 5 years ago.” – Michael Collins in a letter to John O’Kane after the Treaty. “In my opinion it gives us freedom, not the ultimate freedom that all nations desire … but the freedom to achieve it.” – Michael Collins on the Treaty in debates. “Deputies have spoken about whether dead men would approve of it, and they have spoken whether children yet unborn would approve it, but few have spoken of whether the living approve it.” – Michael Collins, Dáil debate, Christmas 1921. “Put him in to get him out.” – Election slogan of Joseph McGuiness, in jail when elected for South Longford. Winston Churchill on Michael Collins. He concluded, “Two ancient races, founders in great measure of the British Empire and the United States, intermingled in a thousand ways across the world, and with the old cause of quarrel ended, must gradually try to help and not to harm each other. “In Arthur Griffith there is a mighty force in Ireland. He has none of the wildness of some I could name. Instead there is an abundance of wisdom and an awareness of things which are Ireland.” – Michael Collins at 14 years of age. “One day he’ll be a great man. He’ll do great work for Ireland.” – Michael Collins’ Father, also named Michael, on his deathbed about his son, who was 6 at the time. The flying column’s guerilla tactics were a new from of warfare that the British refused to recognise. “Later Mao Tse Tung, Tito, General Giap, Che Guevara and Nelson Mandela were to make it respectable” – Ulick O’Connor (pg 15). “Law and order in Ireland have given place to a bloody and brutal anarchy, in which the armed agents of the Crown violate every law in aimless and vindictive and insolent savagery.” – General Sir Hubert Gough, Commander of the Fifth Army in France, after the use of the “Black and Tans” and the Auxilliaries in Ireland. “Michael Collins rose looking as though he were going to shoot some one, preferably himself. In all my life I have never seen so much pain and suffering in restraint.” Churchill on Michael Collins after the signing of the Treaty. “General Collins, who appeared in uniform, is a handsome heavyset youth. He has all the charm of boyishness and much of its shyness, and gives an impression of that combination of gentleness and strength that is probably characteristic of all potentially great leaders … Though his eyes are frequently cast down he gives no suggestion of furtiveness or a lack of frankness, When he speaks one is more conscious of fluency than eloquence.” – American Senator James D. Phelan, July 1922. 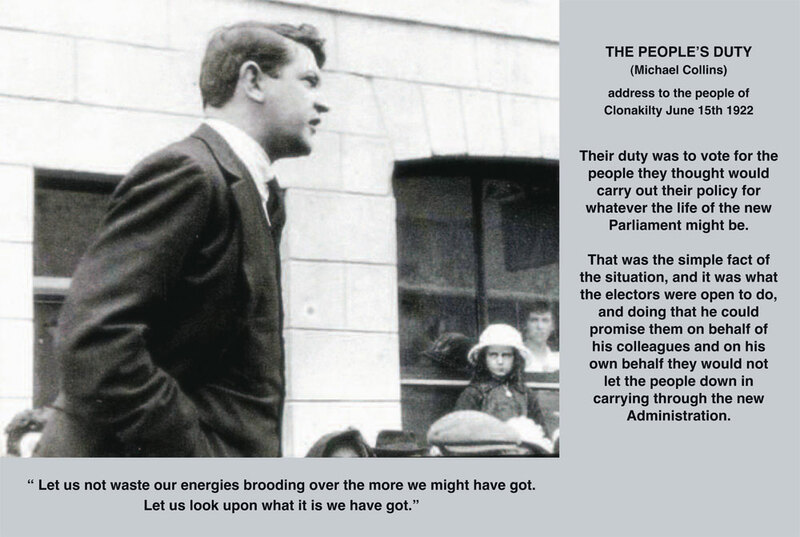 (taken from Michael Collins in his own words). “‘We bend today over the grave of a man not more than thirty years of age, who took to himself the gospel of toil for Ireland, and of sacrifice for their good, and who has made himself a hero and a legend that will stand in the pages of our history with any bright page that was ever written there. Pages have been written by him in the hearts of our people that will never find a place in print. But we lived, some of us with these intimate pages; and those pages that will reach history, meagre though they be, will do good to our country and will inspire us through many a dark hour. Our weaknesses cry out to us, “Michael Collins was too brave.” Michael Collins was not too brave. Every day and every hour he lived he lived it to the full extent of that bravery which God gave to him, and it is for us to be brave as he was—brave before danger, brave before those who lie, brave even to that very great bravery that our weaknesses complained of in him'” – Richard Mulcahy in his oration at Collins’ funeral.